Andrew committed to the full panic spray and pulled out the clutch with the support of his teammates. Andrew started improv to get better at banter while streaming competitive PC games on Twitch. He continues for the incredible community, the comraderie of his brothers on the field of battle, and the hope to one day rank up to level 60. 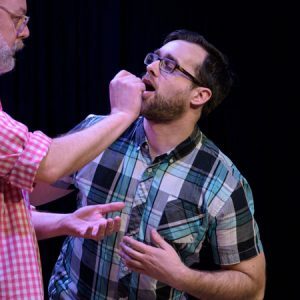 He is all over the map playing on indie teams (swoonface) and Group Therapy, and participated in various festivals with The Enemy of Good at FIST, Law and Disorder at the Genre-Improv Mini-Fest, and MAD LIBS at Improvapalooza. He is also currently a TA helping out at Reflex Improv. Aside from playing anchor on site B, Andrew practices Wim Hof Method cold acclimation therapy and mindfulness and took ballet dance classes at Joy of Motion. He believes in magic and death metal.